Please try the latest version, 2.0.6 and see if that helps. I love this add on however I am having issues with it affecting dungeons I go into with it lagging. When I turn off the addon, it works just fine. I would like to set it up where it wont scan all the time and preferably wont scan if I am in a dungeon. Look my post just below. It happend since the update but it look like no one care. Yeah I'm having this issue as well. I'll play a dungeon and, after probably 5-6 minutes, the game will lag severely and then crash without warning after a 30 second or so delay. Not quite sure what changes could have caused this bug but I will try to look into it. The issue is still happening. Any knowledge on this? This time the game froze and crashed my computer without even a blue screen. This is pointing to a memory leak and for some reason MM is making it worse. The only fix is to turn this addon off and use it only when needed. I am too annoyed to just let it run and crash the game in dungeons. I believe this issue is related to the new don't scan while in combat feature. It always happens to me just as I get out of combat. Sometimes it crashes the game, sometimes it just lags it severely. 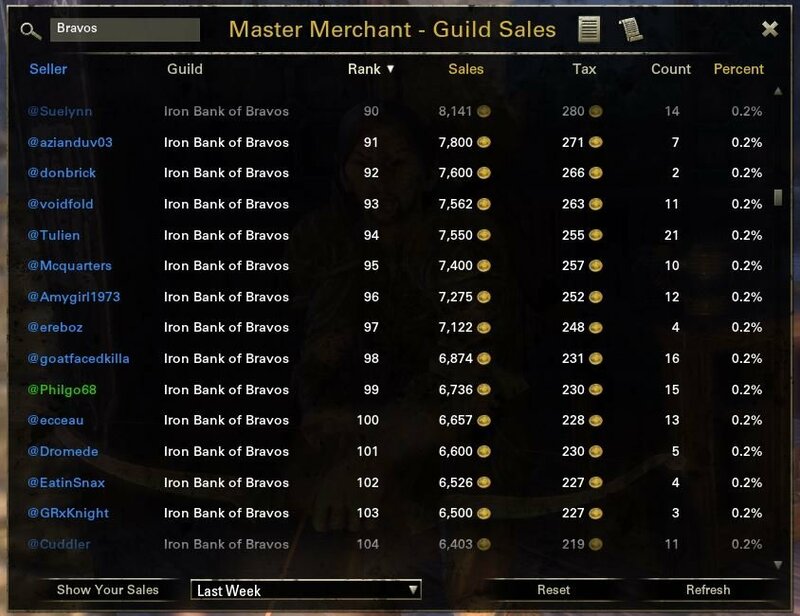 The times when it just lags, but doesn't crash the game, is always followed by a sales report from MM. 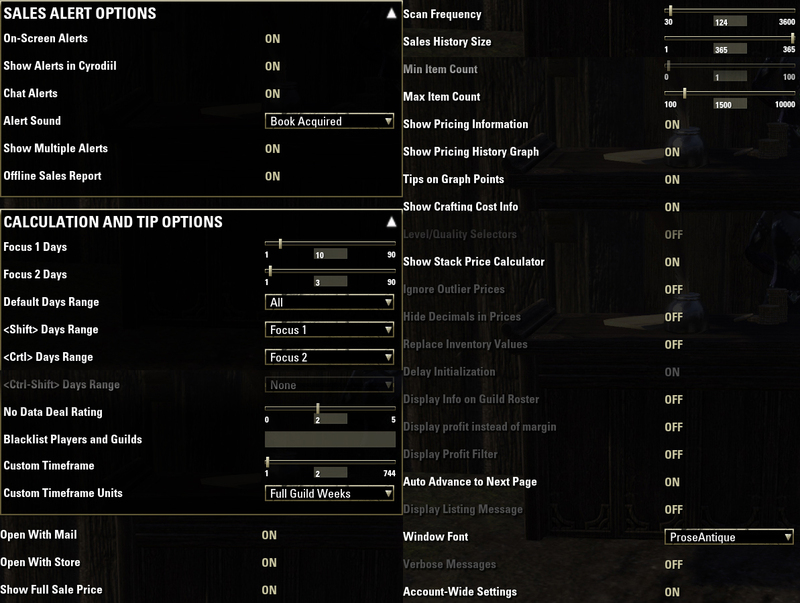 Have never had it actually manage to crash my computer, just ESO. Its gotten to the point where i am just leaving MM off most of the time. 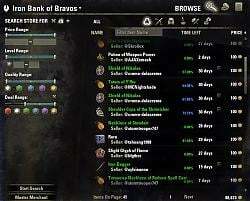 Before Wrathstone update i seem to recall that when you reset MM it checked guilds 10 days back, now it looks like it only scans 5 days back - at least that is the chatoutput i get. I haven't been able to find a way to adjust this and 5 days is a little short for reset i think. 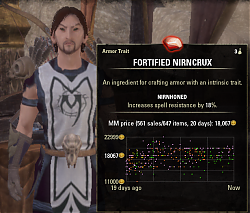 Is there anywhere this can be adjusted? 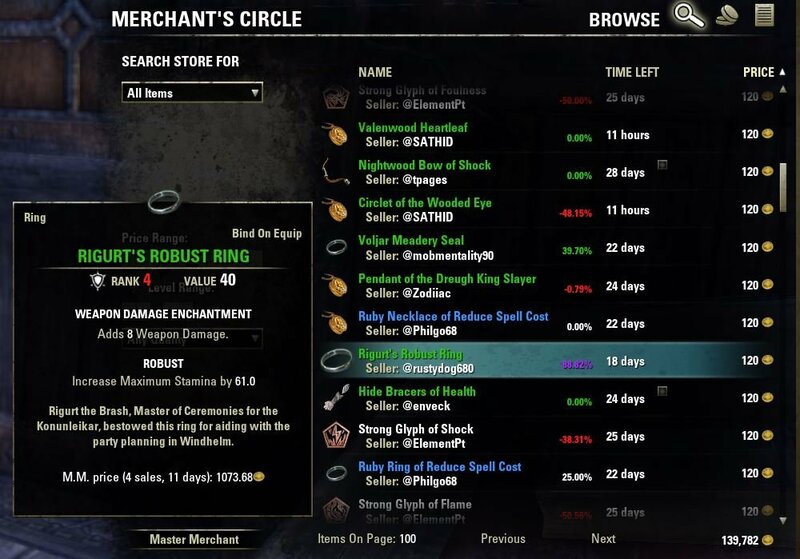 My understanding is that this is an issue that was introduced with the last patch and is on ZOS's end, not MM's. I thought it just came with a database for it. No, That's TTC. I really wish MM would adopt the same strategy as TTC of merging sales data from all users via server upload/download (like the batch file in HarvestMap, it would be optional, of course). I own a small company with a commercial web server, and I would gladly donate the database space and even write the server-side code for free. (I would just need guidance from the author for the mathematical formulae). Philgo68, Please PM me: interested? not interested? it takes too long to scan items in the stores. Also generally it stucks and i need to close store. At the evening time, its awfull. 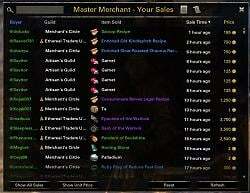 Master Merchant does not Scan the Store. 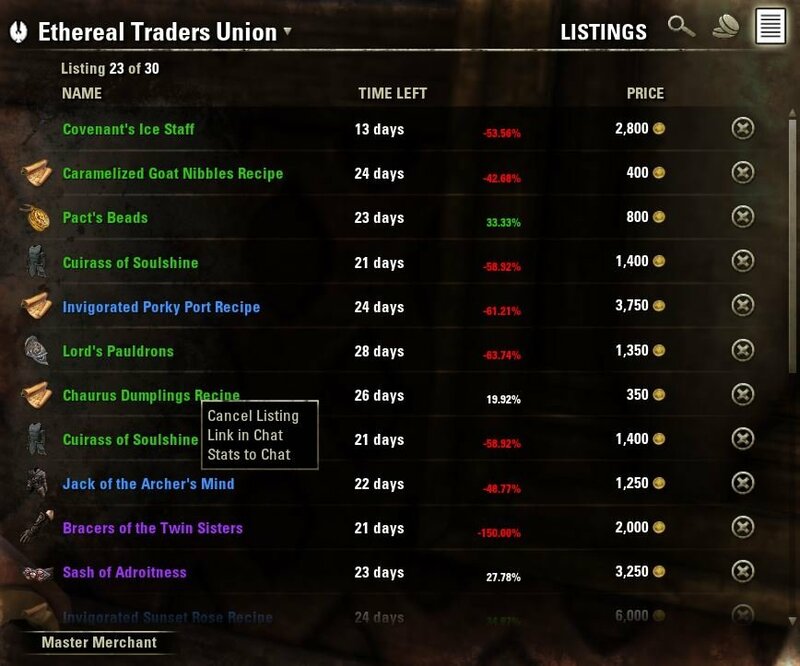 MM looks at guild history for SOLD items to determine prices that things are SELLING for. 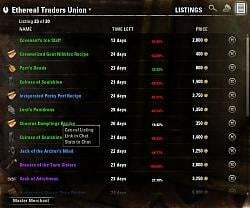 This question is best asked in the add-ons that do scan the store: Awesome Guild Store (AGS), Price Checker, Tamriel Trade Center (TTC), Etc. Last edited by Ahrimar : 03/30/19 at 01:10 PM. First off I want to thank you for a great add on, not sure if I would be playing the game without this, I definitely would not be trading without it. I can't seem to find the above mentioned screen anymore, I believe it is broken but I'm not sure as I did not see any mention of it in posts which I did screen before posting. Any idea when it will be fixed, or can someone point me in the right area to try to fix it myself, or has zen appeared to remove the needed API hooks needed for this? 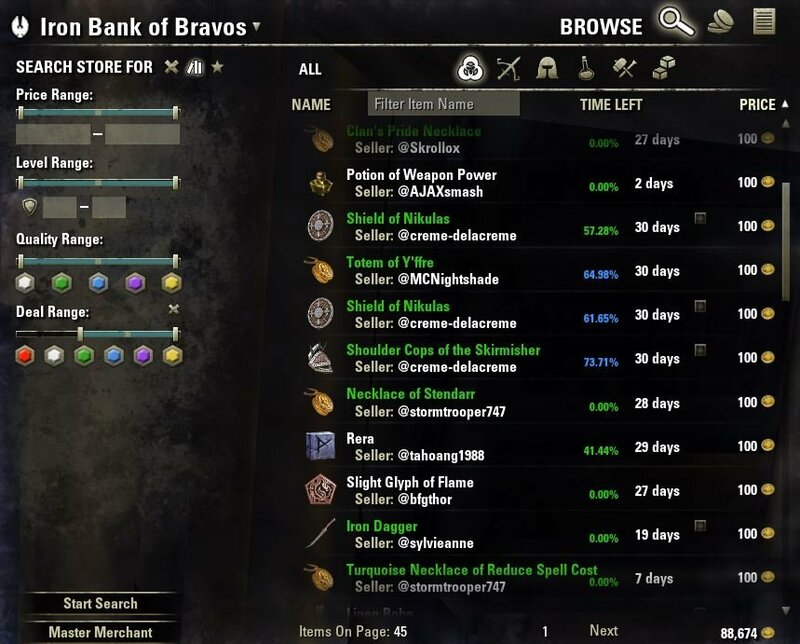 I use the screen to keep track of my sales between the five guilds so that I can try to keep them even in Taxes based on sales, so I really miss this screen. 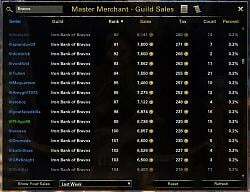 I try to be fair to all of my guilds and this is a quick and major way to do that. Try /mm invisible. Sometimes the MM screen decides to take a holiday; using this command should bring it back. Last edited by SteinAsle : 03/29/19 at 05:23 AM. Did you try turning the setting "Verbose Messages" off? That displays all messages during mm operations. Well, it's very strange, me and all the lot of people I know aren't experiencing this, still here a few users reported this problem and I believe it's true of course, the strange thing is I retain a ton of history, hence my loading is heavy and still I don't get any slowdown or anything after (obviously) the initial loading, less than a minute which I use to gather writs quests, after that there is no issue whatsoever. I'm also running dungeons everyday, these weeks especially since I'm leveling undaunted on some characters and not a problem in this or other content, so it's very strange indeed. 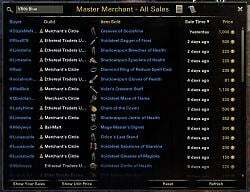 I wonder if may be a conflict with another addon since so many are not affected but some are. 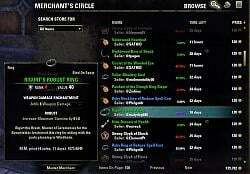 I can try to post my settings (which I DON'T suggest to use because I retain a lot of data for my needs), you users affected could try to post the list of your addons just in case, it couldn't hurt, the authors surely take a look at every report when time permits and in case investigate with some data provided. I just wish you to solve soon. 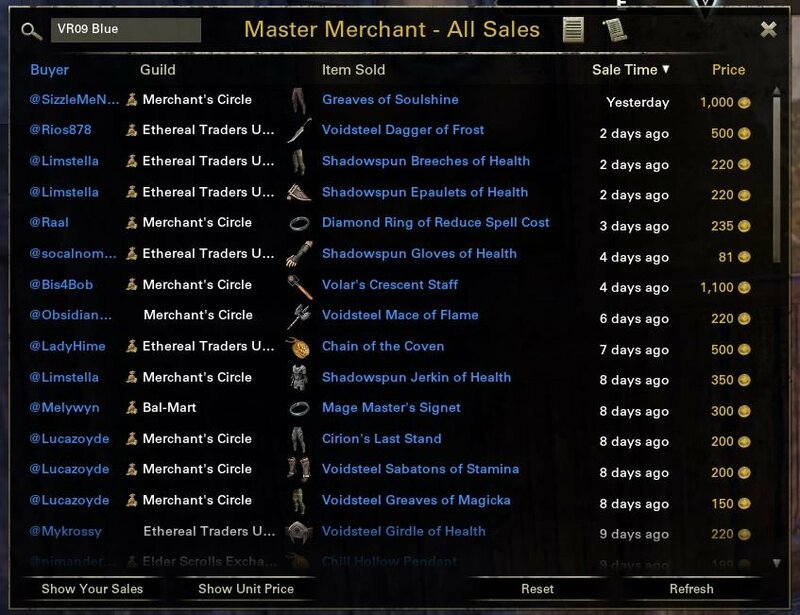 You could also try to delete the mastermerchant.lua files in SavedVariables folder (do a backup first, just in case). I sincerely don't know if would be of any use in this case, it's just one thing I would try if I was experiencing something like that. Last edited by Nova7 : 03/29/19 at 02:09 AM. Yeah I've done this as well but I'd rather have a fix for the situation. I wish I knew more about how the addon works but my semester has kept me quite busy so I can't get too deep into it. 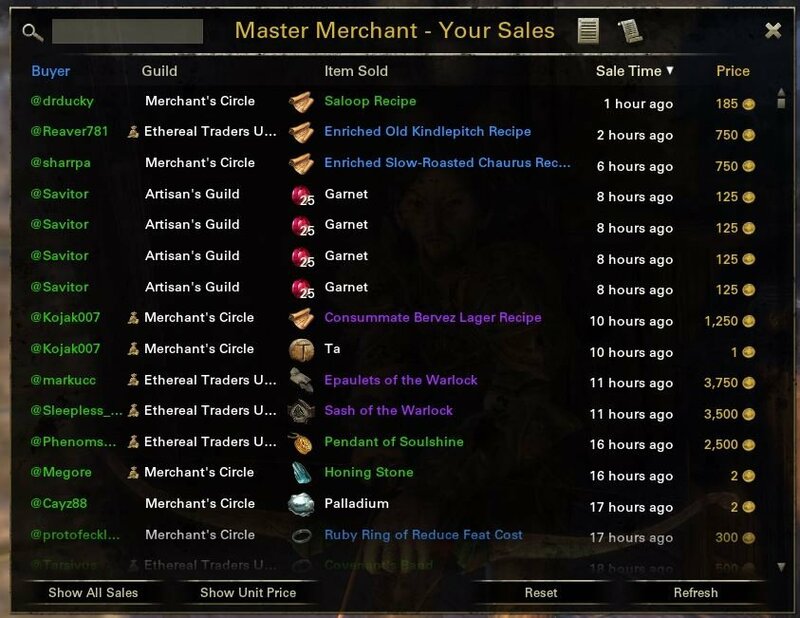 If you are referring to the MM window, you may have accidentally pressed the toggle button "Master Merchant" at the bottom of Awesome guild store filters column (very useful for previews), check down there. Hope it's this, may you solve very soon, it's terrible without mm recaps, it's vital part of the trading screen :-) gl! Last edited by Nova7 : 03/28/19 at 07:51 PM. Last edited by lazy : 03/28/19 at 07:36 PM.